Partial Differential Equations: Theory and Technique provides formal definitions, notational conventions, and a systematic discussion of partial differential equations. 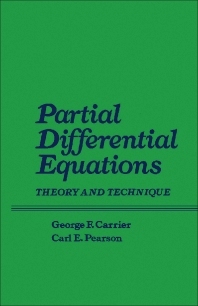 The text emphasizes the acquisition of practical technique in the use of partial differential equations. The book contains discussions on classical second-order equations of diffusion, wave motion, first-order linear and quasi-linear equations, and potential theory. Certain chapters elaborate Green's functions, eigenvalue problems, practical approximation techniques, perturbations (regular and singular), difference equations, and numerical methods. Students of mathematics will find the book very useful.